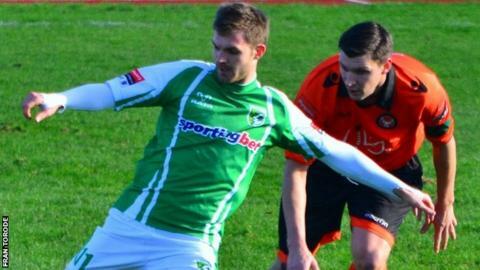 Guernsey FC midfielder Matt Loaring says he is unsure how much longer he will be out injured. Loaring, 23, has not played since hurting his knee during a training run after the end of last season. "I was road running in the off-season, but I didn't give my body enough time to recover and I started getting pain in my knee," he said. "I'm going to have to work hard and hopefully I'll be back before long," he added to BBC Radio Guernsey. Loaring is one of a growing list of players unavailable to manager Tony Vance for Saturday's match against Hastings United in the Isthmian League Division One South. Ross Allen, Craig Young, Sam Cochrane, Glyn Dyer, Tom Martin and Kieran Mahon are all absent and Vance could give first appearances of the season to Danny Hale and Liam Mahon, who have been brought into the squad. "I'm in the gym doing work three or four times a week to try and recover and get out there as soon as I can," added Loaring. "It's the longest I've been out of football, it's a bit of a strange injury, it's not a simple one, but I'm just trying to do what I can to get back out there. "I'm trying to keep myself positive and hopefully I'll see some improvement soon. "I've no idea how long I'll be out for, hopefully not too long, but we'll see."